Are you a manufacturer, woodworker or hobbyist? Are you searching for a high quality hybrid table saw to use in your shop? At the same time, you want to purchase an advantageous tool for the money? 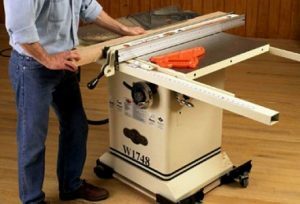 If you are eager to buy a hybrid table saw and need help to make a decision, this article is for you, especially if you are on the threshold of buying a new saw. Naturally, every customer wants to get the best for less price, but as we know, the best costs more. After excluding the most costly table saws, the price range of table saws appears beyond the reach of many buyers. Nevertheless, nobody wants to work with low quality equipment. In this article you will find the solution to your problem. We know the central tool in most workshops is the table saw, one of the most useful tools the a shop will have. The work it does serves as a base for all that comes afterward. So, the most reasonable choice will be a hybrid table saw, which brings you the pros of both cabinet and contractor saws. We will give you our top hybrid table saws for the money 2019. What Is A Hybrid Table Saw ? Until 1999, manufacturers had only two types of saws to consider: “contractor” style saws and “cabinet” saws and it was obvious which one to choose. If you take price and portability out of the question, cabinet saws are certainly more powerful and in general more accurate. Having large motors, fully enclosed bases, and solid, better quality moving parts, they are easier to use and hook up to a dust collector. On the other hand, cabinet saws typically cost twice as much as the less advantageous contractor table saws. Along with that, they’re also heavy that moving them without help – or a forklift – is almost impossible . In 1999 DeWalt introduced its DW746, the first hybrid table saw, and launched the production of a relatively new class of table saws. 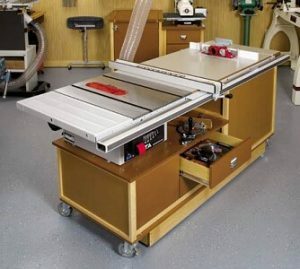 A hybrid table saw is a stationary table saw, built to look like a more expensive cabinet making saw, with the motor inside, but with internal parts more like a less expensive contractor saw. They were designed to compete in the market with high-end contractor table saws. Hybrid saws capture some of the most valuable features of the cabinet saw at a price that’s still in range for the hobbyist. And while they’re not in quite the same class as their larger cousins, hybrid saws are sturdy and well constructed, and offer many advantages. They are lighter and are equipped with motors in the 1-1/2 – 1-3/4 HP range (that means they can be used with standard 110 volt service). Some hybrid saws have a cabinet type of base and others have a shorter base and legs. In either case, the base is fully enclosed, with the motor mounted inside the base, instead of on the back of the saw, as with a contractor saw. Hybrid saws are equipped with more substantial trunnions and arbor bearings, often a more advanced drive belt system, and better gearing than most contractor saws. The hybrid model is usually assumed to be a smaller contractor motor paired with a cabinet stand and internal motor mount; more precisely, the true distinction is based on the trunnion design. Hybrid saws use contractor saw trunnion assemblies, which are built lighter and typically are hang mounted from the bottom of the table versus the beefier cabinet saw trunnion assemblies, which are supported by the top of the cabinet itself. Once you’ve decided it’s time to become serious about woodworking, you’ll need a table saw. Whether you enjoy building furniture, DIY projects, flower boxes, or birdhouses, it’s the table saw that makes it all happen. Hybrid table saws are built for both quality woodwork and safety. To keep owners safe the table saw must possess tight security features. There are a number of criteria you should keep in mind while choosing the right model of hybrid table saw. Blade capacity determines the maximum depth of cut a saw can achieve. The larger the blade, the deeper the cut. To achieve accurate and smooth cutting, the table saw must be powerful with a strong and wide shredding capacity. Some hybrid saws offer a sliding table as an option to improve cross cutting capability. Blade capacity is one of the major factors which power tool manufacturers take into account when designing a saw. Everyone wants the biggest capacity possible, so that they can cut the thickest material possible. Hybrid saws have a 1.5 or 2 HP motor and the ability to run on a standard 15 or 20 A/ 120V circuit, while a cabinet saw’s 3 hp or larger motor requires a 240 volt supply. A 1.75HP motor will typically run on a 20A/110V circuit. Larger HP motors need to be connected to 220V with an appropriate wall outlet. If you intend to use the saw for production, daily, and/or for thick hardwoods, then you will appreciate the power of a 3 – 5 HP motor. Splitter: A splitter or riving knife is a vertical projection located behind the saw blade. This can be a pin or a fin. It is slightly narrower in width than the blade and located directly in line with the blade. The splitter prevents the material being cut from being rotated thereby helping to prevent kickback. Splitters may incorporate pawls, a mechanism with teeth designed to bite into wood and preventing kickback. Splitters can take many forms, including being part of the blade guard that comes standard with the saw. Another type of splitter is simply a vertical pin or fin attached to an insert. Close to a decade ago a clever inventor came up with a safety feature for power tools that could detect when a blade made contact with human flesh and instantly retract it to prevent injury. Unfortunately, it destroyed the tool in the process. The so called SawStop technology was amazing, and probably life-saving, but it left a lot of people without saws. The secret to the saw’s near-instant reaction time is an explosive cartridge that’s triggered when the saw blade detects the conductivity of human flesh. Some table saws take 45 minutes to install while others can take 4 hours. Exact time depends on each table saw. A complicated assembly can be a drawback. The instruction manual will assist in its setup but making adjustments can take a long time. Vibration in a contractor saw can result in poor quality cuts and saw blade marks. The standard pulleys normally installed on table saws are cast pulleys. They don’t run perfectly true and as a result, create vibration in the saw. The most beneficial change possible with most belt driven tools is the removal of the old V drive belt(s), and the installation of correctly sized link belts. Drive mechanisms can be a single v-belt, a serpentine belt or multiple v-belts. If you plan on getting a left-tilting cabinet or a hybrid table saw, you’ll need to consider a few things. The motor on these is placed to the left of the operator, as is its cover. This might not matter much, until you want some accessories such as a sliding table. This is because the motor cover on a left-tilting saw will get in the way of the sliding table brackets which connect a sliding table to the table saw. However, there are no crucial differences between the two tilt configurations. Dust collection is an important part of any woodworking shop. Dust is both a health hazard and time consuming to clean up. Table saws are notorious for creating a lot of dust in the shop and is a machine that needs some extra attention. A lot of newer table saw models have some effective built-in dust collection features but saws that are a little older don’t have these features. Hybrid saws on the market today offer an enclosed cabinet to help improve dust collection. The cabinet can either be similar to a cabinet saw with a full enclosure from the table top to the floor or a shorter cabinet on legs. Some hybrid saws have cabinet-mounted trunnions and some have table-mounted trunnions. The base houses the working parts of the saw, including the trunnions, the arbor assembly, the sector gears, and sometimes the motor. Open base saws have legs that extend from the bottom of the base to the floor. Recently, a few “hybrid” saws combine the features of a cabinet base and an open base have appeared on the market. These saws have legs, but the base is enclosed on all sides to facilitate dust collection and limit noise. 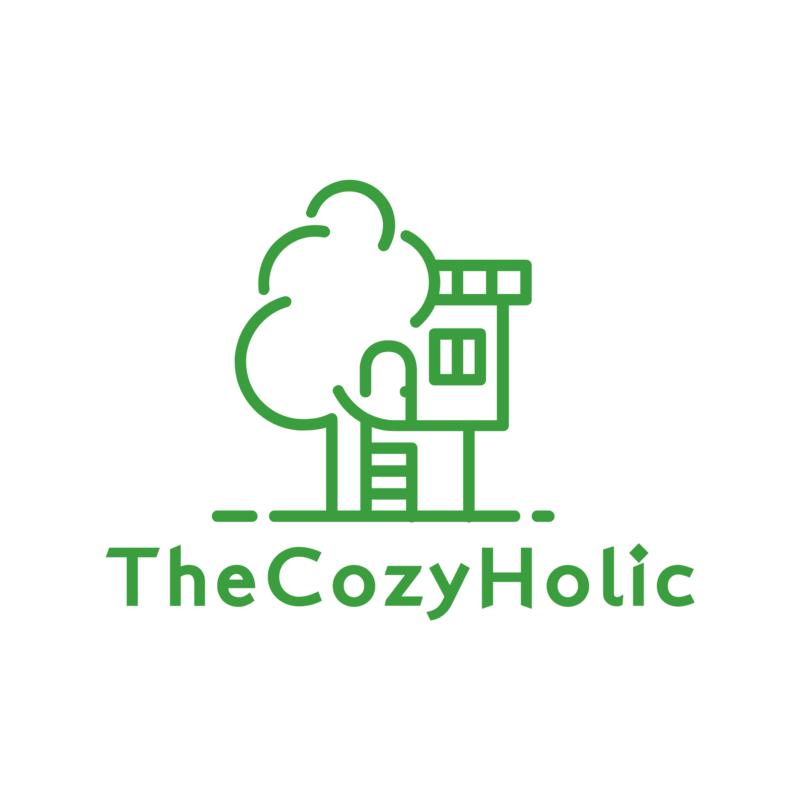 No matter if you are an individual DIY hobbyist or a professional craftsman, the above points, including quality and price, play an important role in your purchase decision. Home’N’Rollcarefully selected the best models of cabinet table saws based on the above points. This Grizzly hybrid table saw has an enclosed cabinet with 4″ dust port, heavy-duty cast-iron trunnions that mount to the cabinet, and plenty of power to easily rip through hardwood or cut dadoes. It’s still light enough to move around (it weighs approximately 286 lbs. when fully assembled) and it’s easy on the budget. The fence on this machine is also a hybrid of some of the best features we’ve had on table saws in the last 30+ years. It has the easy lift-off and simple adjustability of the popular T-shape shop fox classic fence, the rock-solid front-and-rear locking ability of the Shop Fox Original Fence, And the Accessory T-Slots of The Shop Fox Aluma-Classic Fence. To top it all off, this saw features an Innovative quick-release blade guard and riving knife system that can be changed in seconds-and it’s prewired to run on an ordinary 120V, 20A circuit. cast iron table and extension wings, cast iron trunnions, easy-glide fence system, quick-release blade guard and riving knife, 4″ dust port, etl listed, T-slot miter gauge, includes a 10″ X 40T carbide-tipped blade. Recommended for: hobbyists, home shops, and “weekend warrior” woodworkers. The Grizzly 10″ hybrid saw is a hybrid table saw under 1000. It has plenty of power to easily rip through hardwood or cut dadoes. Works much quieter than other saws thanks to its serpentine belt. The device also has a quick release feature for the riving knife, motor guard, and splitter assembly. The Shop Fox W1837 has plenty of power with its 2 HP motor. With the Shop Fox W1837, you get the best of both worlds. 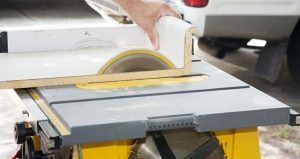 The easy-to-transport weight and size of a high-end contractor saw, but with dust control and the full features of a cabinet saw. The W1837 features a handy built-in kickstand operated mobile base. With a simple push on the foot lever the machine rises off it’s otherwise stable feet to become mobile. The robust cast iron trunnions absorb vibration, ensure proper blade-to-fence and miter slot alignment and make blade height and angle adjustments a breeze. The enclosed bottom cabinet features a dust chute with a 4-inch port. The blade can tilt to the left from anywhere between 0 and 45-degrees. Great for cutting bevels, compound miters, or chamfers. The Shop Fox comes equipped with a polycarbonate guard shield that allows the operator to see the blade. Enclosed bottom cabinet with a 4″ dust port; Precision-ground cast iron table; Table measures: 40-1/4″ x 27″; Lift-off Precision Fence with front/rear locking ability; Quick‐Release Blade Guard Assembly; Riving knife; Robust Cabinet Mounted Trunnions; Built-in foot operated mobility system; T‐Slot Miter Gauge; Easy‐Glide Fence System. Motor: 2 HP, 120V/240V, single-phase; Pre-Wired for 120V; Amps: 15A at 120V, 7.5A at 240V; Weight: 243 lbs; Rip capacity: 30″ to right, 15″ to left; Speed: 3450 RPM; Maximum blade diameter: 10″; Arbor: 5/8″; Maximum Depth of Cut At 90°: 3-1/4″; Maximum Depth of Cut At 45°: 2-1/4″; Blade tilt: Left. The easy of transport of a high-end contractor saw, but with dust control and the full features of a cabinet saw. Just like the Shop Fox professional cabinet saws, this hybrid also has a quick-change blade guard with anti-kickback pawls that can be positioned away from the workpiece. The Fusion Table Saw is a Premium Light Duty Table Saw. Unlike other hybrids, the trunnion is not attached to the tabletop, but mounted onto the frame like a real cabinet saw, this ensures the tabletop stays flat. Throat-Plate: Standard ; Optional Dado insert available; Weight Net/Ship: 266/349 Lbs. CSA. Fence Storage; Built In Wheels; Quick Change Riving Knife; Precision Fence w. Hairline Readout; Double Miter Slot ; Push-stick Mounted Onto Fence. Sometimes additional parts have to be bought. The Laguna fusion table saw is a very convenient tool to use because of its built-in wheels and light weight. It boasts ease of mobility with two fixed wheels and one swivel wheel, and also comes equipped with a unique tubular stand for maximum support and stability. Also the dust collection of laguna table saw is excellent. A 4″dust port on the left hand side.. The Baileigh 110/220V Single Phase, (Prewired 110V) 10″ Hybrid Style Table Saw. 1.75 hp motor turns the blade at 4,000 rpm. Accepts standard 10” blades with a ⅝” arbor. Runs on either 110- or 220-volt single-phase power. Large, all-machined 44” x 27” cast iron table. The cast tabletop is webbed into the base. No twisting, shrinking, or expanding. Zero-clearance table inserts prevent small pieces from falling into the gap and minimize chips on the back side of the cut. A durable rip fence incorporates a digital readout (DRO) for rip capacity. Just zero the DRO at the blade for convenient repeatability. Plastic handwheels on the base for controlling the blade height and miter angle. Includes a miter gauge on the cabinet. The trunnion is fastened to the base and minimizes vibrations and keeps machine noise within a safe decibel level. A 4” dust collection port lets you hook up an extraction system. Caster wheels on the base allow for easy storage. While the digital rip capacity is an ingenious option, it can attract attention away from the project, which can lead to an increase in injuries. The Baileigh TS-1044H Hybrid Style Table Saw has a great number of advantages. The operator can choose to operate on 110 volts or choose to operate on 220 volts. The heavy duty fence incorporates a digital readout to document rip capacity. What is the best hybrid table saw 2019? We realize that purchasing a table saw is a big investment to make. 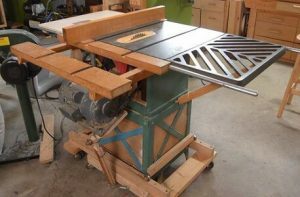 So, this article highlights essential features potential buyer should consider in selecting a decent hybrid table saw. It is crucial a purchaser has an understanding of the hybrid table saw terms to make a good choice. They have to pay attention to blade capacity, horsepower, dust control, ease of adjustment, riving knife and other features. After comparing the 4 best hybrid table saws 2019, it became obvious that The Shop Fox W1837 is our top budget recommendation for a hybrid table saw. Unlike many hybrids, it is like a cabinet saw with the bottom cut out. This is a great, inexpensive step up from a contractor saw for people looking for the most portable hybrid. It has distinguishing pros and works excellently on both hardwood and softwood. This saw is sure to be the envy in any shop or worksite. Some hybrid table saws need to purchase additional accessories or replace standard ones, so learn the description attentively before making a purchase.